Toyohara Kunichika (1835-1900) Okubi-e Portrait of Nakamura Sagisuke, 1869. Oban. This is an example, (cited earlier) of what led the Japanese scholar Kojima Usui to acclaim Kunichika as 'the premier figure since Sharaku in actor portraiture'. It is a simply outstanding piece of art, a magnificent piece of woodblock printing and an extraordinary piece of portraiture. It comes from an untitled series of twenty-two actor portraits of eleven separate actors. The style of the set is directly influenced by the great and career defining series of Kunisada okubi-e of 1860 - 64. 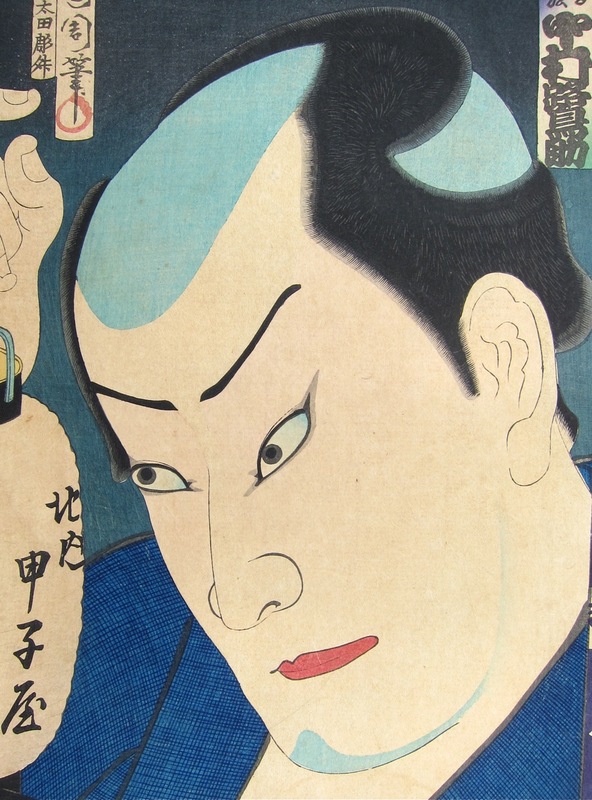 Kunisada oversaw the production of seventy-two prints but died before the set was completed. 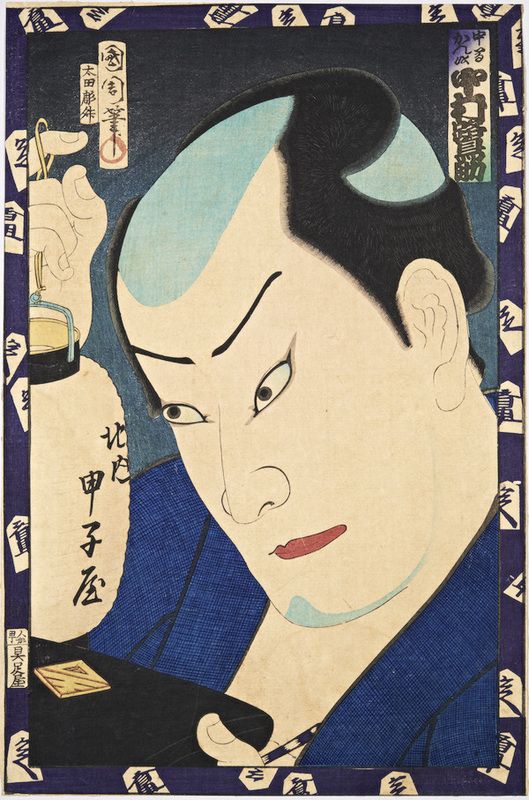 Yoshitora completed the set and there was discontent that a pupil of Kuniyoshi’s should have been given the task. Kunichika’s first, great okubi-e series is sometimes seen as a response to this perceived slight. Kunichika’s series includes a decorative border studded with the crest of the actor portrayed. A stunning print, in the hugely collectible series. The role is putatively thought to be Nakama Kanji, from the play Yukanba Kichisa. Kawatake Shinshichi II's drama Kichisama Mairu Yukari no Otozure was premiered in the 7th lunar month of 1869 at the Nakamuraza. It parodied the famous story of Yaoya Oshichi and mixed it with a kodan (dramatic recital), which was made by Kenkonbo Ryosai and was entitled Kobori Seidan, a story about family troubles (sodo) in the Kobori samurai clan. Sagisuke plays the part of Kanji. A copy of this print is in the collection of the Museum of Fine Arts Boston. The colour, condition and impression are all fine, barring a few surface marks, full size, untrimmed. The print is lightly backed.